Kalevi Aho has written concertos for so many instruments that it was only a matter of time before he alighted on the theremin. Named after its inventor Léon Theremin, who patented the device in 1928, it's controlled not by touch but by the position of the player’s hands in the ether above it. As you can imagine it’s a fiendishly difficult thing to play, as a short promotional video for this recording confirms. After that the horn should be a cakewalk, but then Aho is known for the demands he makes on his soloists; in other words, expect the unexpected. Which is precisely how I approached the first concerto, written for and premiered by the horn player Annu Salminen and the Lappeenranta City Orchestra. In a single span containing five linked sections it’s a dark and turbulent work that requires the soloist to move around the orchestra. Salminen is first heard off-stage, which means there’s a disconcerting degree of ambient noise at the outset. The on-stage percussion is quiet but terrifying - a gathering storm à la Berlioz, perhaps – before we are plunged into a maelstrom of strange sonorities and, for the soloist, taxing microtones. If you’ve been keeping abreast of the composer’s output – all of it assiduously reviewed on this site – you may be surprised at the stark, uncompromising character of this new work. It requires a degree of concentration in order to track its evolving ideas/patterns and competing rhythms, but such diligence always pays off where Aho is concerned. It’s passionately argued and played and, paradoxically for a piece that appears so impenetrable, it’s actually quite accessible. Salminen – who ends where she began, off-stage - is a remarkable artist; flexible and firm of tone, even under duress, she’s a player I’d be happy to hear in other rep as well. For me and, I suspect, others the real curiosity is the Theremin Concerto; its subtitle refers to the Sami people of Lapland, whose year is divided not into four seasons but eight. The work was written for Carolina Eyck and commissioned by the Lapland Chamber Orchestra, the latter no strangers to Aho’s work. The quietly expectant Harvest soon gives rise to the sinuous song of the theremin. Given that this is an instrument with so much comic potential – Sheldon Cooper’s dolorous doodles in the hit US TV series The Big Bang Theory comes to mind – it’s artfully integrated into the orchestra at this point. The swirl of Autumn Colours is highly evocative, and the theremin’s downward swoops are managed with style and a commendably straight face. This is pictorial writing of some originality; the flurries of Black Snow are interspersed with desolate calls from the soloist, while Christmas Darkness has a palpable, breathing presence that’s apt to raise a goose-bump or three. Winter Frost finds Eyck and Aho at their most excitable and off-the-wall. What a peculiar noise the theremon makes here; indeed, I can imagine some listeners will find it risible at times. The piece is rescued from all-out ridicule by the haunting beauty of Crusted Snow – what extraordinary skill and patience it must take to control the theremin in this way – and the elemental crack and thud of the orchestra in Breaking Ice. Most eloquent, though, is Midnight Sun, which brings with it a powerful sense of immensity - past and present - that has echoes of Aho’s monumental Twelfth Symphony 'Luosto'. The Theremin Concerto isn't the best of Aho’s oeuvre - not by a long chalk - and I'm tempted to think the composer chose the instrument for the same reason that mountaineers aspire to Everest; because it's there. Mildly entertaining, but mainly incongruous, this isn't a piece I'd wish to hear often; goodness, that's the very first time I've felt this way about any of Aho's output. Don't be tempted to write him off though, for the Horn Concerto is a work of astonishing clarity and focus. Indeed, the more I listened to it the more I was struck by the level of inspiration here. The admirable John Storgårds holds it all together very well and the Lapland orchestra play with great enthusiasmand energy throughout. The recording is full, warm and very atmospheric, especially in the first concerto. Now for some observations about downloads in general and this one in partcular. I use a number of media players on my Mac - Songbird, VLC and Audirvana - and I'm surprised to find that some attacca movements don't play seamlessly. Perhaps I've just been lucky but I haven't had this problem with the 150 or so high-res downloads in my library. Coincidentally, perhaps, I've now encountered fractional dropouts in two recent BIS releases. To be fair the issue only arises with VLC and not with Songbird or Audirvana. It isn't a big deal, I suppose, but it could be if VLC is your player of choice. 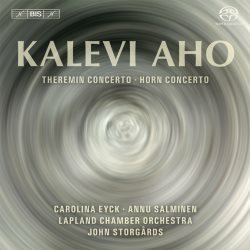 Aho's Horn Concerto is a deeply impressive construct; though clever, the Theremin Concerto is comparatively lightweight.